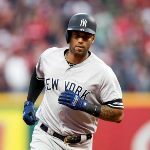 With seven games left in the regular season and a wild-card berth already clinched, the Yankees look to secure a home playoff game during their upcoming four-game road series with the Tampa Bay Rays. Aaron Hicks has been a monster in the lineup over the last week. He hit his 26th home run of the season on Saturday to rank third among MLB switch-hitters this season. Hicks is also the seventh switch-hitter in Yankees’ history to hit 25 homers in a season and is batting 375 during his current six-game hit streak. On the mound, the Yankees bullpen got a huge lift with the return of closer Aroldis Chapman.After shaking off the rust he threw a clean inning two days ago against the Baltimore Orioles in the 3-2 extra innings playoff-clinching win. The Yankees flamethrower is now looking to continue his postseason dominance and help the Bronx Bombers earn home-field advantage for their upcoming wild-card game. In game 1 the Yankees will send the right-handed Jonathan Holder to the mound opposite Dominican pitcher Diego Castillo. Game 2 will feature Yankees ace Luis Severino getting the starting nod against Jake Faria, who’s failed to earn a decision in his last five appearances and has not won a game since August 1. Although Severino’s lost two of his last three games, he looked brilliant in his most recent start as he worked seven innings of one-run ball while striking out six batters against the Boston Red Sox. In game 3 on Wednesday, Japanese pitcher Masahiro Tanaka will go head-to-head against relief pitcher Ryne Stanek. Tanaka has won three of his last four games but failed to get a decision in his most recent appearance as he allowed five runs in just four innings against the Boston Red Sox on September 20. In Thursday’s series finale veteran pitcher C.C. Sabathia will start against reliever Jaime Schultz. Sabathia has lost three of his last five games but had a solid start in his most recent outing on September 21 when he earned the win as he struck out five hitters and pitched six innings against the Orioles. The Yankees have won four of their last six games, but they lost their last home game of the season 6-3 to the Orioles. The Bombers must now try to secure home-field advantage in Tampa before heading to Boston to close the season in a three-game series against the Red Sox. The Yankees will face the Oakland Athletics in the American League Wild Card game although the location has yet to be determined.